It is assumed that after historic results such as the one Chelsea suffered at the Etihad Stadium last Sunday, the immediate reaction from a head coach would be to crack the whip on his players and get a wave of immediate positive anger out of them for the weeks and months ahead. However, Maurizio Sarri took a different route. He had watched his team get dismantled to the very minutest piece of ignominy. They were battered by their Man City counterparts who looked primed for the three points. Pep Guardiola’s side were relentless and put six goals past Kepa Arrizabalaga in a game, not just he, but everyone connected to the Blues will like to forget quickly. 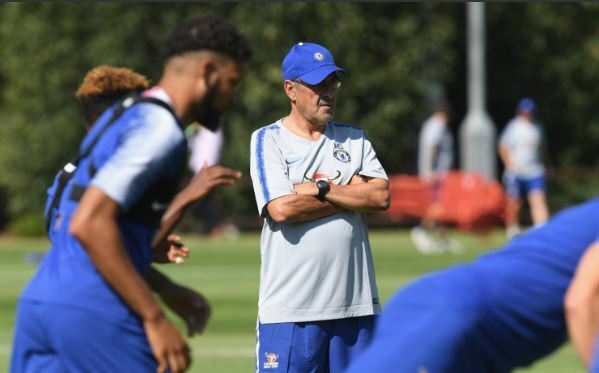 According to Simon Johnson of the London Evening Standard, Sarri appeared at Cobham on Monday morning taking his training session normally. He added in his tweet, the former Napoli man is probably just making preparations for the Europa League clash against Malmo FF. been told #Sarri will be taking training at #cfc as normal this morning. Case of 'business as usual' and focus on preparing for Malmo game. Perhaps, Sarri is exhausted with his constant post-game angry reactions and wants to take a different path now. Either way, it looks like it will take a little more than just some shouting to get these players back into form.